With Reef-A-Palooza almost upon us, I thought it would be a good idea to feature a WYSIWYG coral from the folks that put on the New York and Orlando shows, World Wide Corals. Normally I don’t “ohh and ahh” over a Rhodactis mushroom but this one looks very beautiful, making this our Featured Coral of the Week. 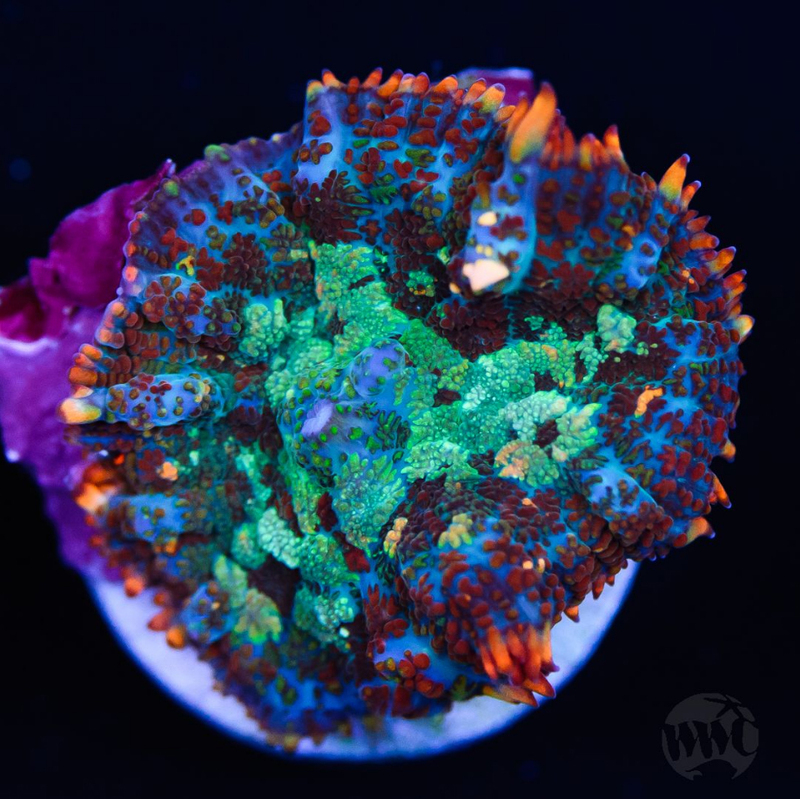 As of today, they only have one Rhodactis like this in stock and WWC is offering it for $129.00. The Rhodactis or Bullseye mushroom, as it’s sometimes called, is often seen in violet to blue or with margins and highlights in orange. What makes this mushroom unique is the rainbow of colors seen in the specimen. Papillae form a cauliflower-like patterns, and they typically can grow to about 3 inches in diameter. Rhodactis resemble both coral and anemones, although technically they are neither. Lacking a skeleton, Rhodactis is classified as a corallimorph. Corallimorphs more often than not, lack elongated and retractable feeding or sweeper tentacles. Instead of feeding tentacles the majority of them have small, bump-like tentacles or nobs that are less efficient at capturing prey when compared to many corals. While true, many species of Rhodactis possess stinging cells and some larger species are even capable of capturing and consuming small fish through their mouths. Rhodactis mushrooms are one of the easiest corals to maintain in the reef aquarium however, some prefer lower illumination and slow to moderate water movement. Considered semi-aggressive in nature, it is advisable to provide this coral adequate space between itself and other corals while considering growth and asexual reproduction. Reproduction in the aquarium occurs primarily by longitudinal fission, a process by which the color divides itself in half and forming a new mouth on each half. In the wild, these corals typically do quite well in the nutrient-rich backwaters and other areas with greater turbidity. Therefore, having pristine water quality for this Corallimorph is not necessary. For this particular species, symbiotic algae called zooxanthellae hosted within the polyp provide the majority of its nutritional requirements through photosynthesis. But this coral can and will eat plankton, small invertebrates and prepared LPS coral foods such as Fauna Marin LPS food or Coral Frenzy to name a few.